The Plum Brook reactor complex is viewed from above. 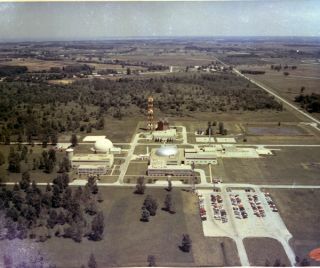 In this historical photo from the U.S. space agency, the Plum Brook reactor complex, show from above in 1969, consisted of numerous research facilities and support buildings. The containment vessel's silver dome was at the center of the main reactor building. The reactor office and lab building was located in the immediate foreground, and the hot laboratory was adjacent on the right. Across the road to the left was the reactor office building and assembly, test, and storage building. Behind it was the large, white helium storage structure. Behind the reactor building were the service equipment building, the cooling tower, and the water tower. The fan house and the waste-handling building were behind the hot laboratory.